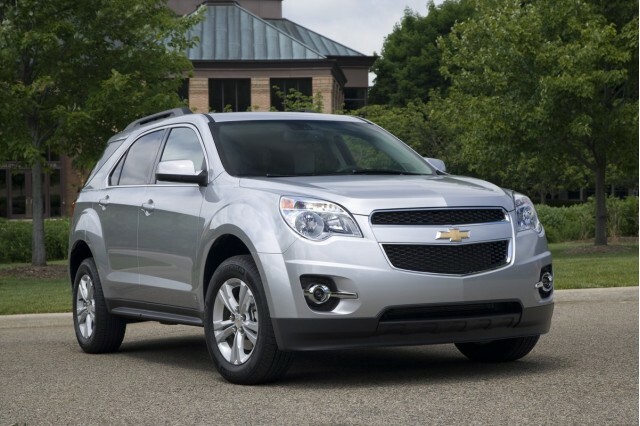 High-Mileage Chevy Equinox, GMC Terrain To Get Eco eAssist System For 2014? The mild-hybrid system that General Motors calls eAssist (on the 2012 Buick Lacrosse and Regal models) will also appear on the 2013 Chevrolet Malibu Eco version. But now it appears that the system will spread further across GM's product lines, with a report on GMInsideNews that it will appear on both the Chevrolet Equinox and GMC Terrain crossover utility vehicles for the 2014 model year. With the 2013 Malibu launching solely in its highest-mileage Malibu Eco form at first, demand for the 2.4-liter EcoTech engine with the hybrid alternator-starter attached is expected to decline once an all-new 2.5-liter non-hybrid four is offered later in the model year as the base Malibu engine. To keep monthly production of its mild-hybrid engines as consistent as possible, GM reportedly plans to offer that engine in the Equinox and Terrain (which are built in the same factories and largely identical under the skin), starting in 2013. 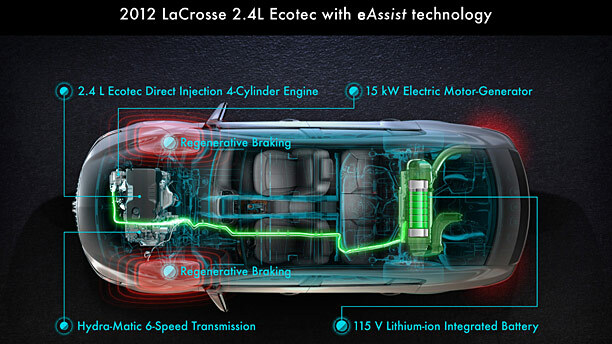 The Lacrosse with eAssist is rated by the EPA at 25 mpg city, 36 mpg highway, improvements of 32 and 20 percent respectively over the 2011 Lacrosse fitted with the non-hybrid 2.4-liter four-cylinder engine (rated at 19 mpg city, 30 mpg highway). Applying those same improvements to the 2012 Equinox with the base 2.4-liter four, it could be rated as high as 29 mpg city, 38 mpg highway (against its current ratings of 22 city, 32 highway). 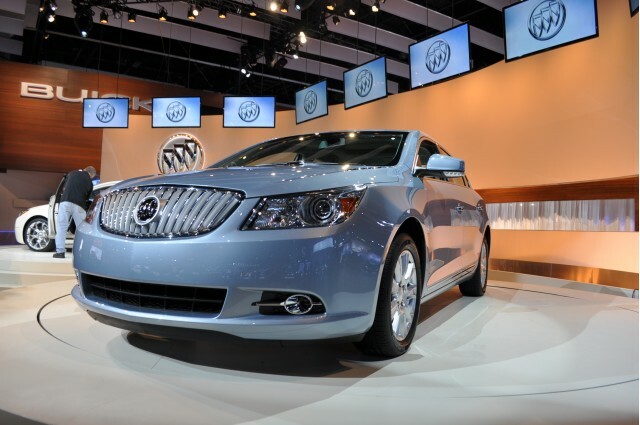 The 2012 Buick Lacrosse with eAssist sedan is priced at $30,820 with destination, and is the sole four-cylinder Lacrosse offered for 2012 (a 3.6-liter V-6 is the only engine option). GM's first TV ad for the Lacrosse with eAssist focuses solely on the engine shutoff feature, and doesn't use the word "hybrid" at all. 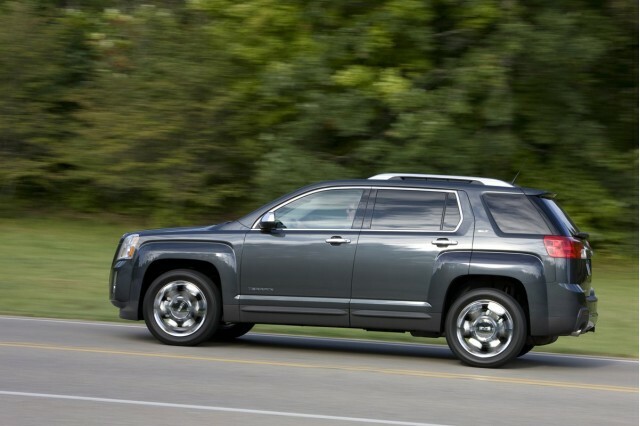 Adding the mild-hybrid system to the 2014 GMC Terrain will require a new, GMC-specific sub-brand denoting higher fuel economy. With Buick using "eAssist" and Chevy adding "Eco" to its model names, GMC is not likely simply to tack on "Hybrid" as it does for its low-volume 2012 GMC Sierra Hybrid pickup truck.